Thanks Scotty! … and we’re off and running! Good luck everyone! THE WINNER WILL DEFINATELY BE A HARBAUGH COACHED TEAM BUT IT WILL BE THE NINERS! 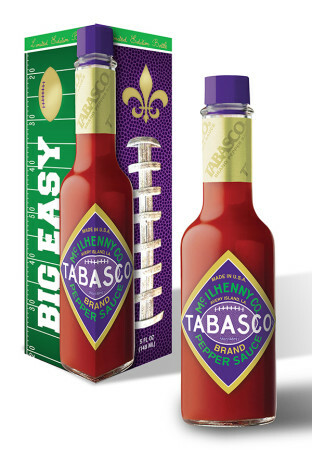 Gotta be the Ravens since hot sauce goes best with a bird! I like your theme Doug! Thanks and good luck! Ravens will fly away with this one !!!!!! Gonna go with the east coast team. Ravens! Woo hoo! oh. I’m supposed to be neutral. Um.. yay. The Dirty Birds Falcons couldn’t get it done, so why should the Ravens be any better? I’ll go with the 49ers! Ravens! Lackluster?? Two great defensive teams, a record setting rookie quarter back, a 17 year seasoned veterans last game, potential for the long ball on both sides of the offense, sibling coaches. Sounds like a potential close game and a possible thriller! Go Ravens and Go Tabasco! As a native San Diegan and a Chargers fan gotta go w/ the AFC. Ravens will win. Either way I’ll be too busy grillin for all my friends who are coming over so email me if I win a bottle! Going to be the Ravens. Thinkin’ it’s gonna be the Ravens. I think it is gonna be the Ravens. s.f. 49’s all the way!!! The 49er’s are the next Super Bowl Champions! Sorry Brian, gonna go with the niners. I was torn, Balt is in my teams divison and bitter rival. But if Niners win, they tie my team in total sb victories. In the end, I tossed a coin. Any team That Can defeat the Broncos and the Patriots on the road can beat anyone. My money is on the Ravens.